De Simpson is the Office Manager for C&H Solutions. She graduated from the University of Northern Colorado with a Bachelors of Science in Business and a Minor in Economics. 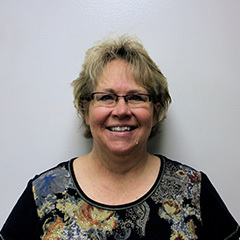 De joined C&H in February of 2011 and manages all front office procedures, standards, operations and office staff. Prior to C&H she was the Office Manager for a rural water district before transitioning to business analyst for the 2nd largest produce vendor to Wal-Mart. De and her husband have been married for 36 years! They have three amazing children and have been blessed with 6 wonderful grandchildren. De and her husband enjoy traveling, playing with the grandkids and life on the farm!